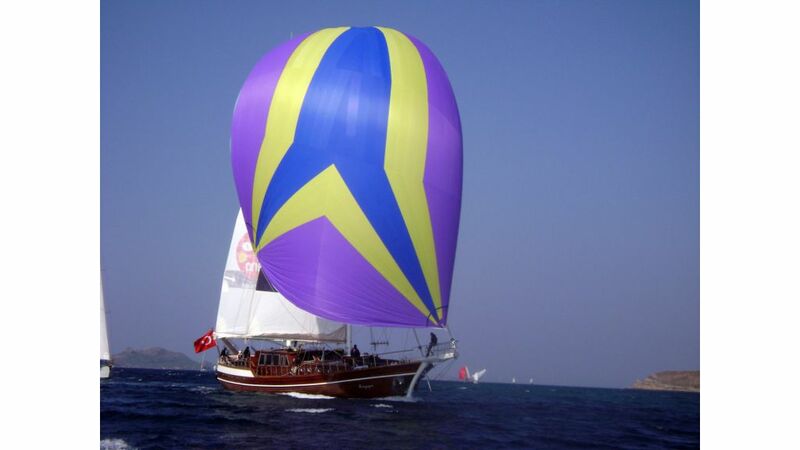 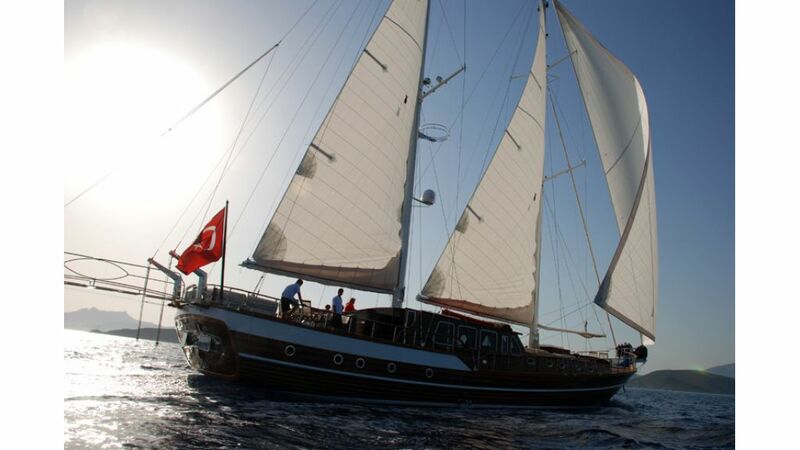 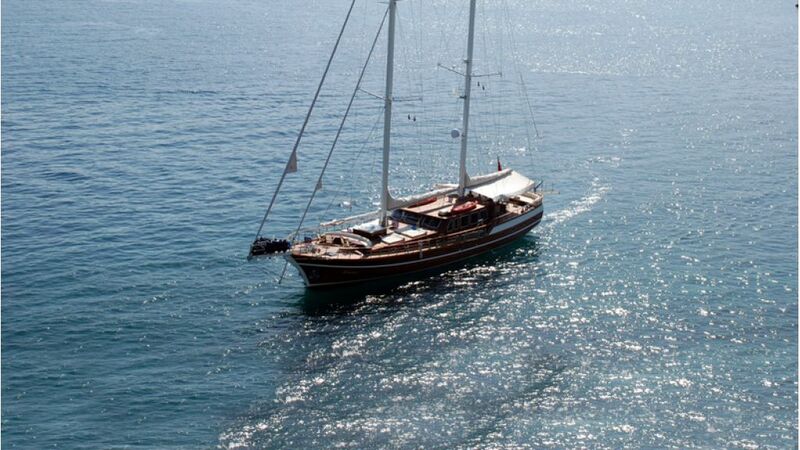 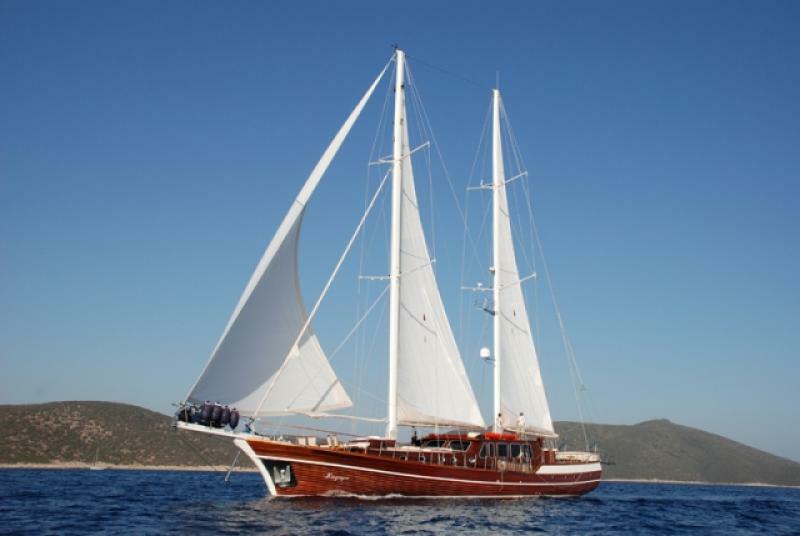 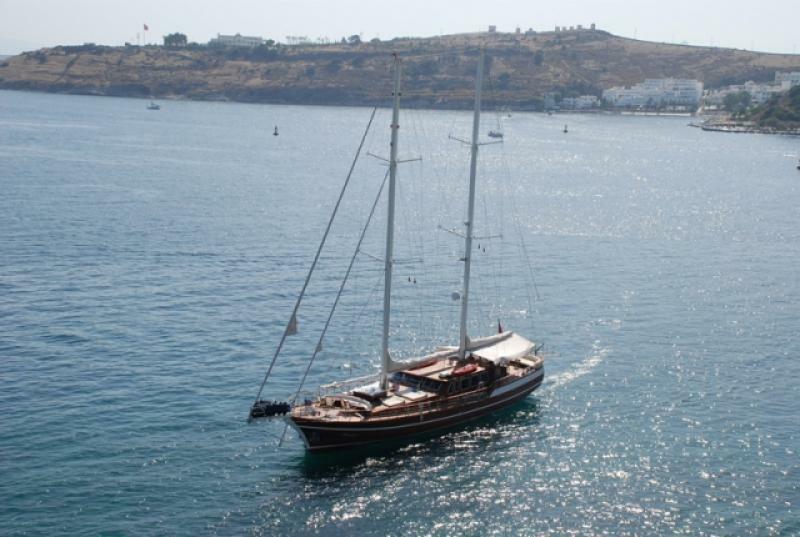 Luxury Gulet, Sagapo was completed in September 2008 and will be a brand new for the 2009 Mediterranean season. 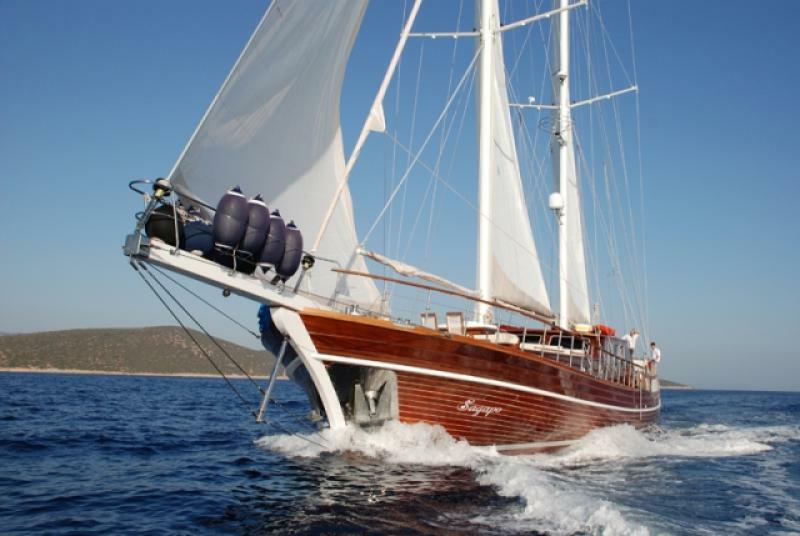 Sagapo is one of the most luxurious and finely appointed Gulets available on the Turkish Coast and the Greek Islands of the Mediterranean Sea. 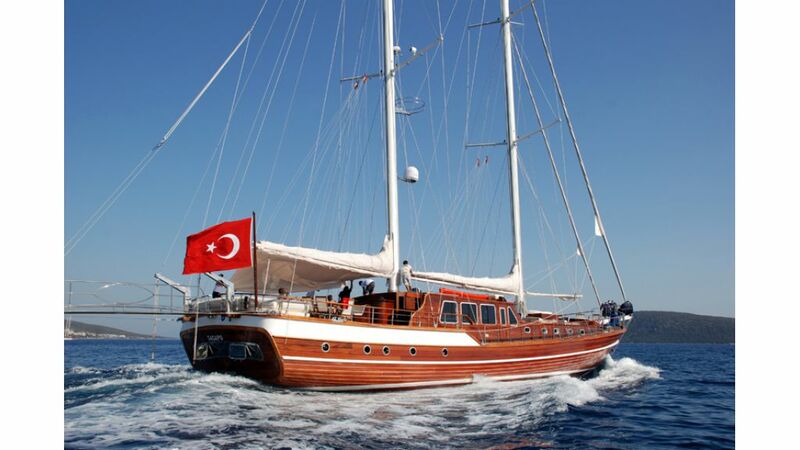 Based in Turkey, Sagapo features beautiful wood detail throughout and an uncluttered, modern and spacious interior.. 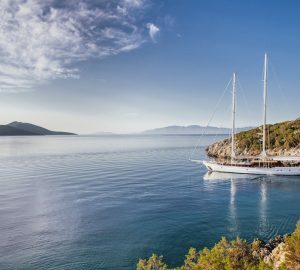 Featuring two huge master cabins, two double cabins and two twin cabins, all with ensuite bathrooms, this stunning luxury Gulet is perfect for twelve guests. 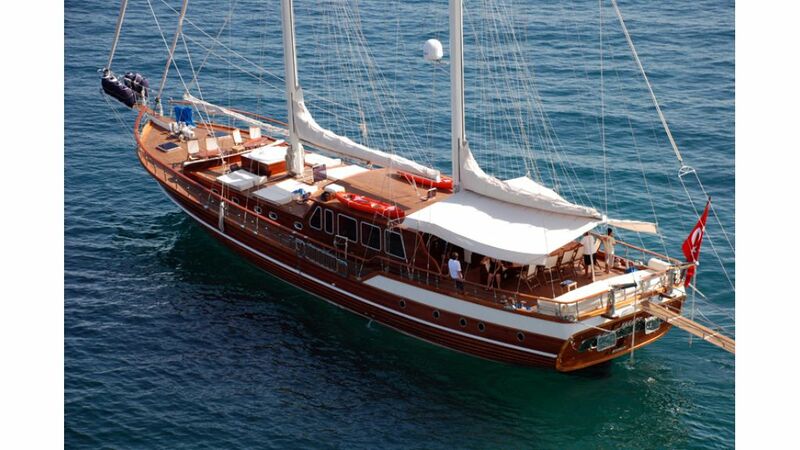 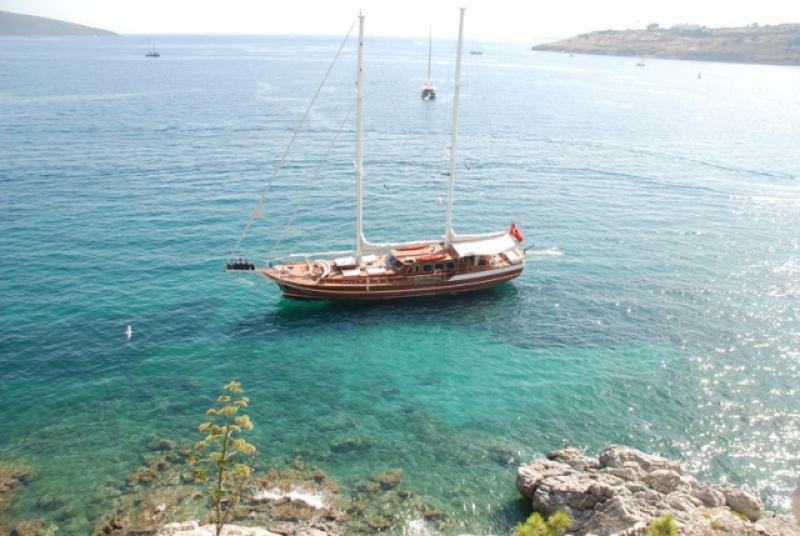 Luxury Gulet Sagapo offers her guests plenty of deck space to soak up the Mediterranean sunshine. 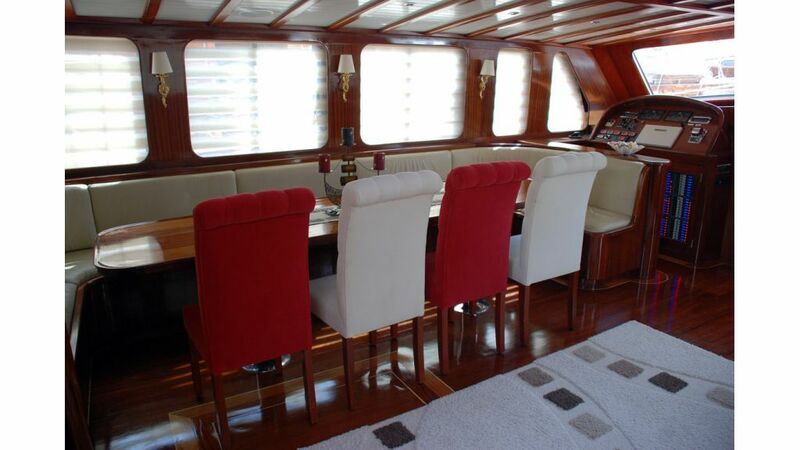 She has twelve comfortable sun-loungers on her forward deck so everyone can relax and sunbath together. 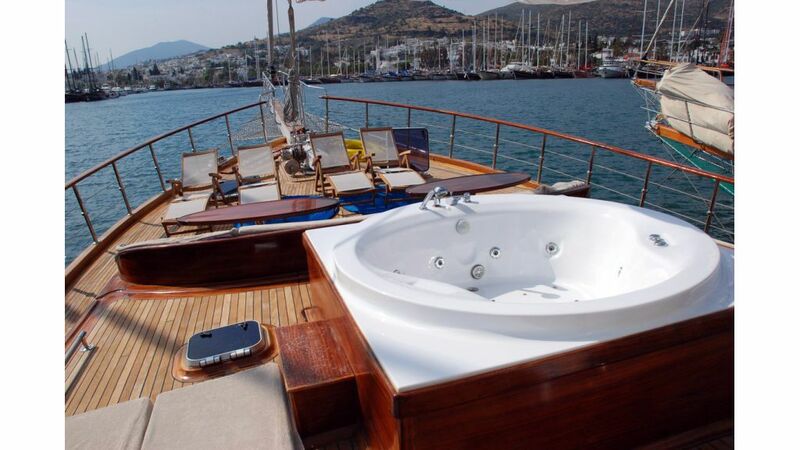 Sagapo is also one of the only Gulets in Turkey to feature a Spa Pool on deck. 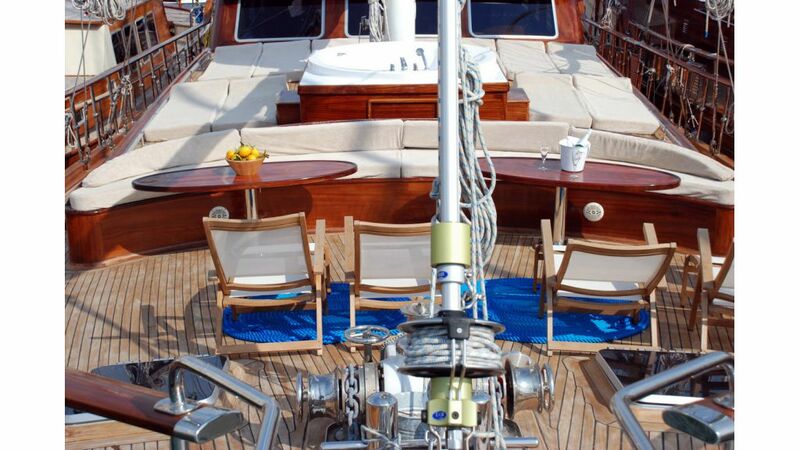 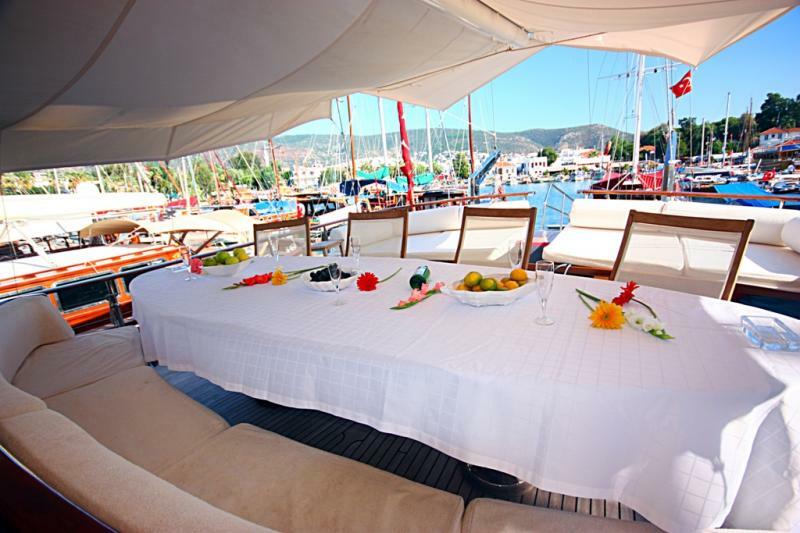 Alfresco dining on the aft deck for twelve is also another fantastic feature of this luxury Gulet. 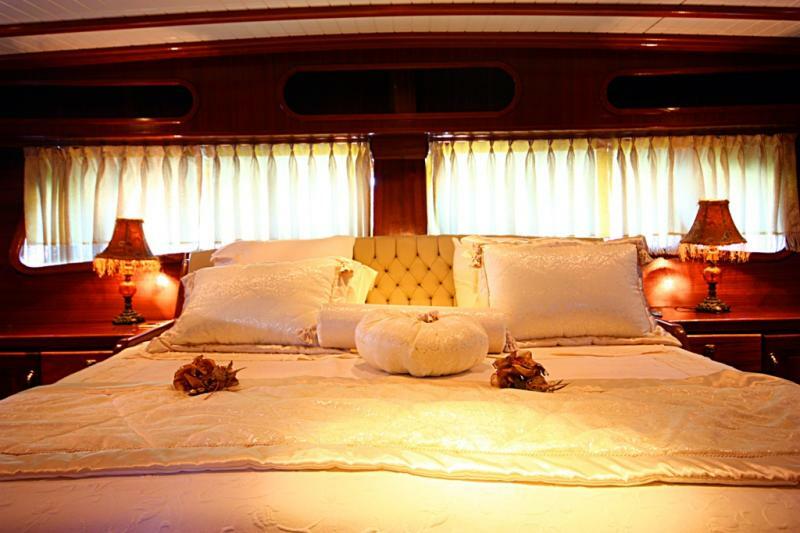 Five crew are on hand to ensure that you are pampered and have everything that you could possibly want during your luxury charter. 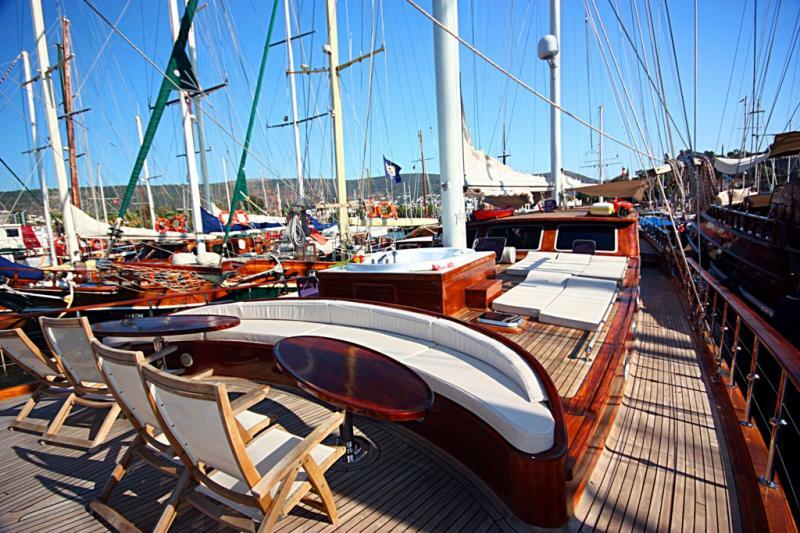 Your professional Captain has spent years sailing all over the Mediterranean and knows all the secluded bays or the hottest night spots in your chosen area. 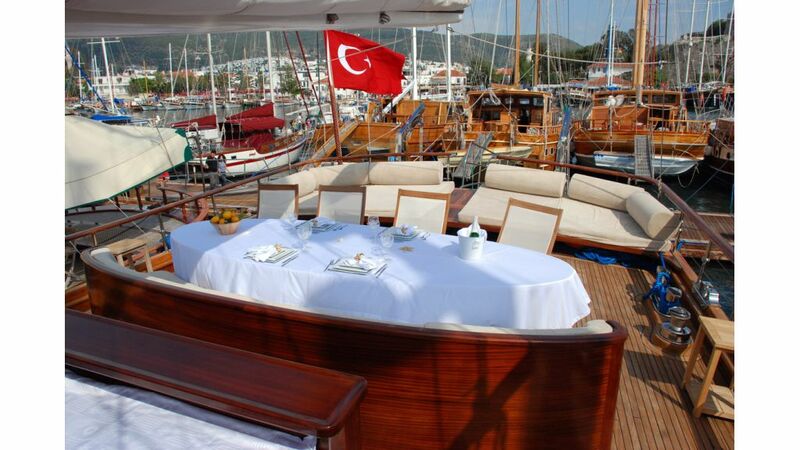 Sagapo has a reputation of offering one of the most sumptuous menus in Turkey and Greece. 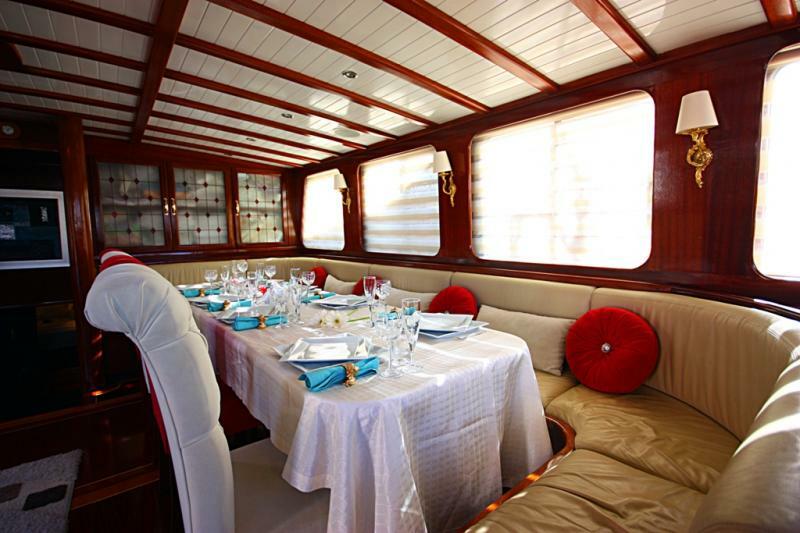 The chef is will delight you with the gourmet Mediterranean Cuisine cooked to your personal specifications. 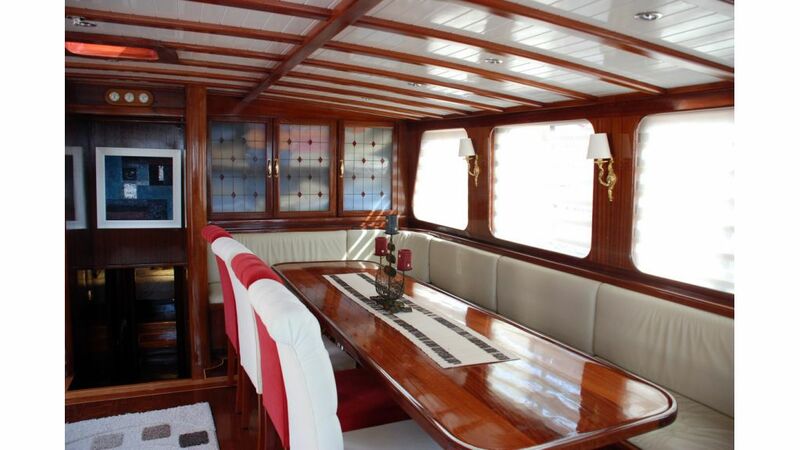 Relax and dine with your family and friends on deck or inside in the spacious air-conditioned Salon. 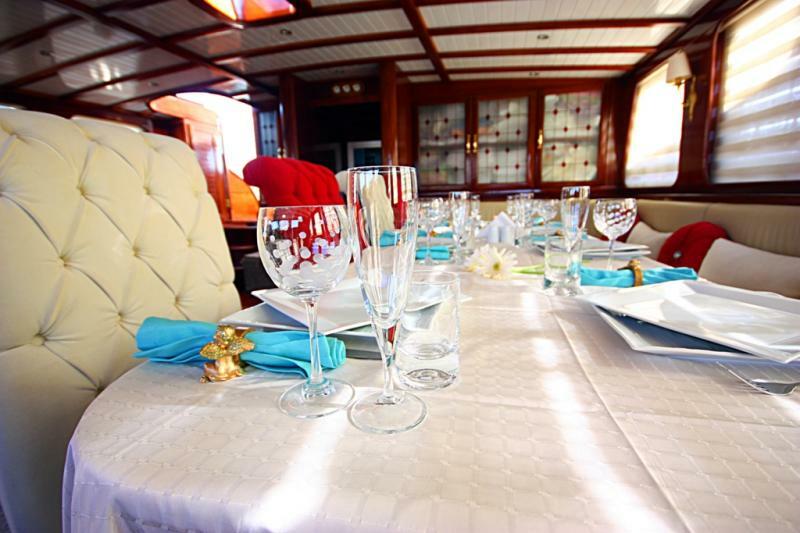 Meal plans are available and all menus are tailored to guest’s dietary requirements. 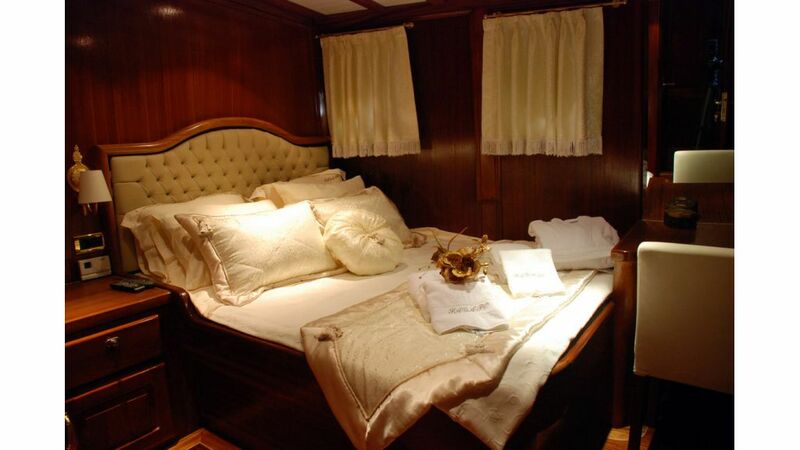 Luxury Gullet Sagapo accommodates twelve guests in six cabins. 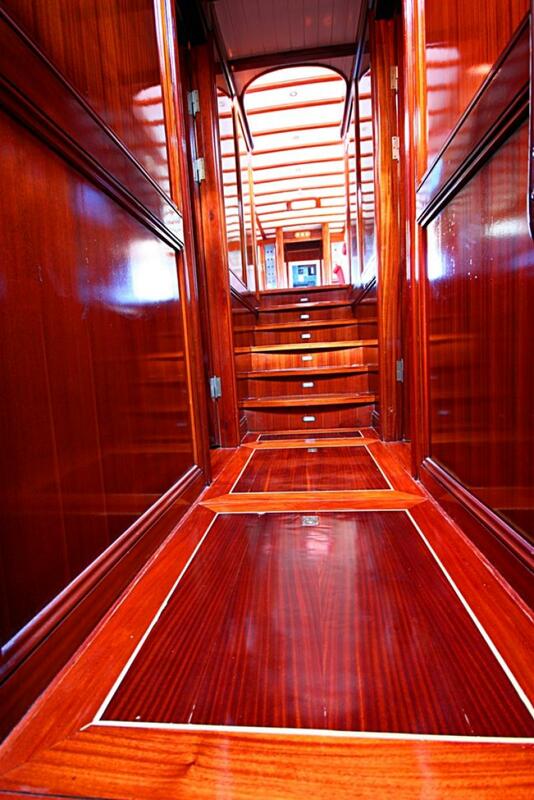 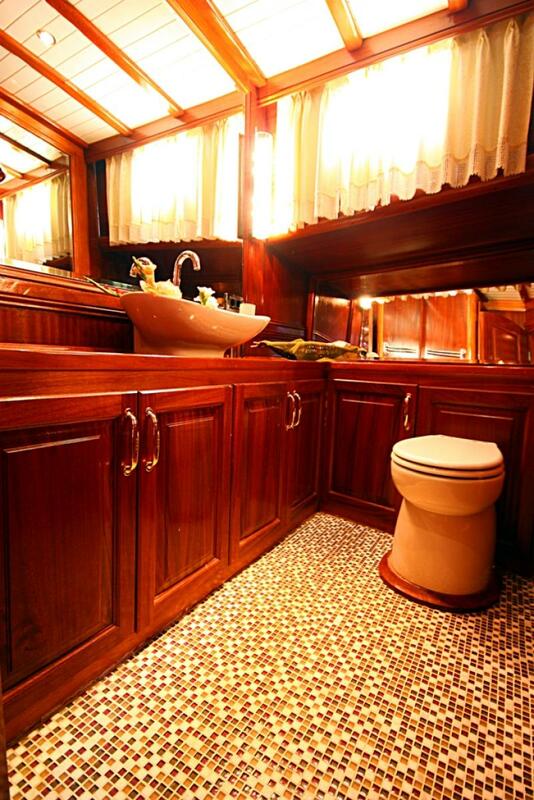 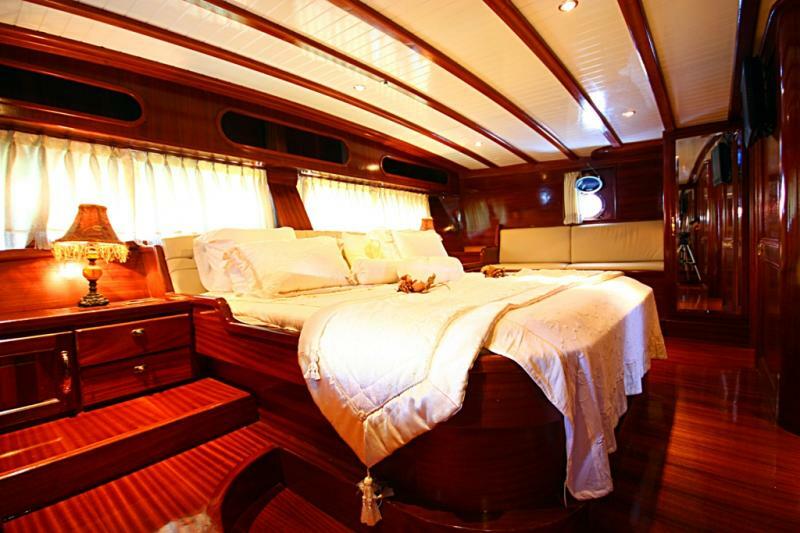 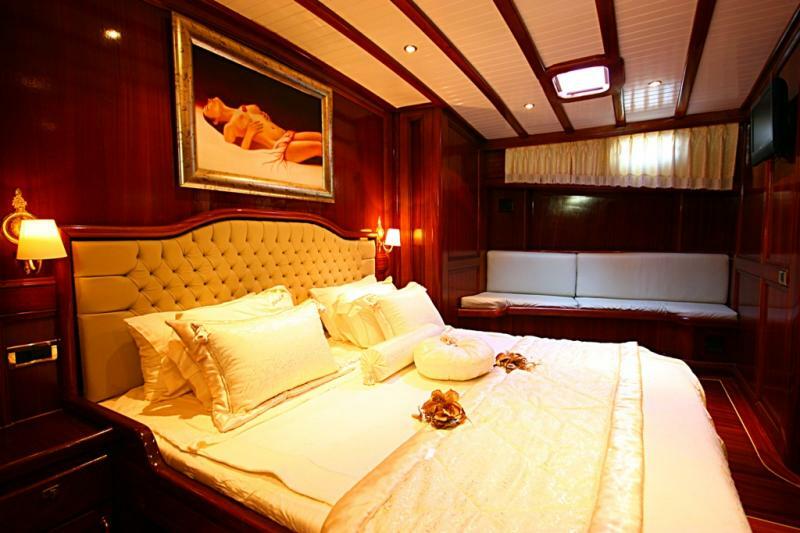 She has two huge master cabins with ensuite bathrooms as well as two generous doubles and two twin cabins. 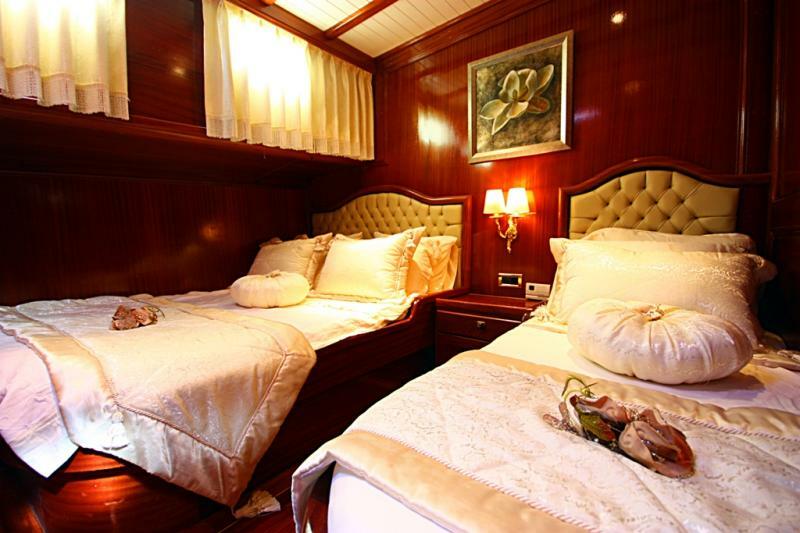 All guest cabins are air- conditioned and have ensuite bathrooms. 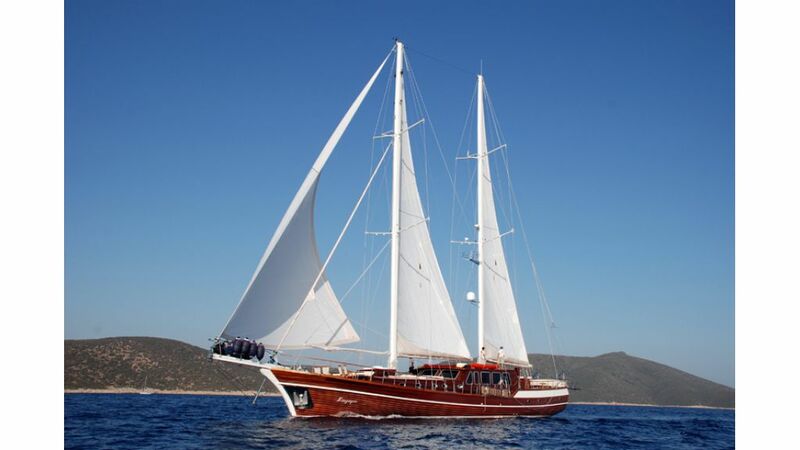 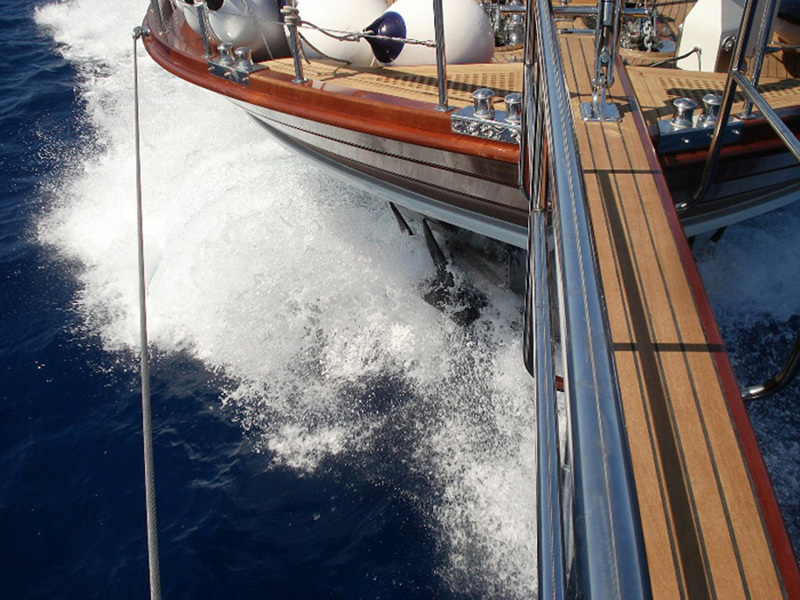 Luxury Gulet Sagapo’s water toys include a tender for waterskiing and tubing as well as, snorkeling equipment, fishing equipment and two kayaks. 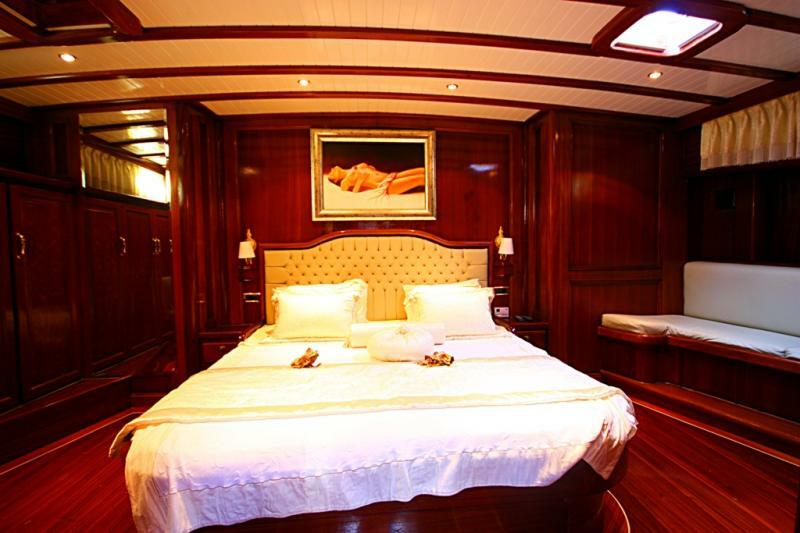 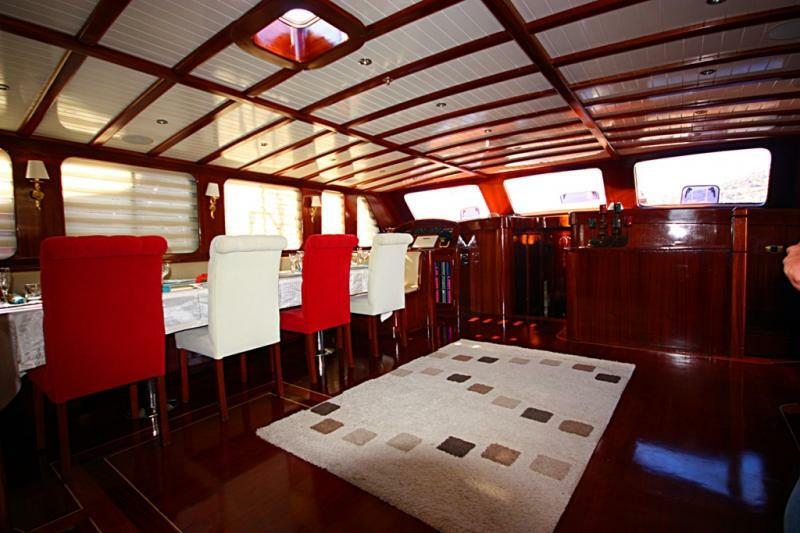 Her spacious decks have twelve sun-loungers on the foredeck so that all guests can relax and enjoy the scenery together. 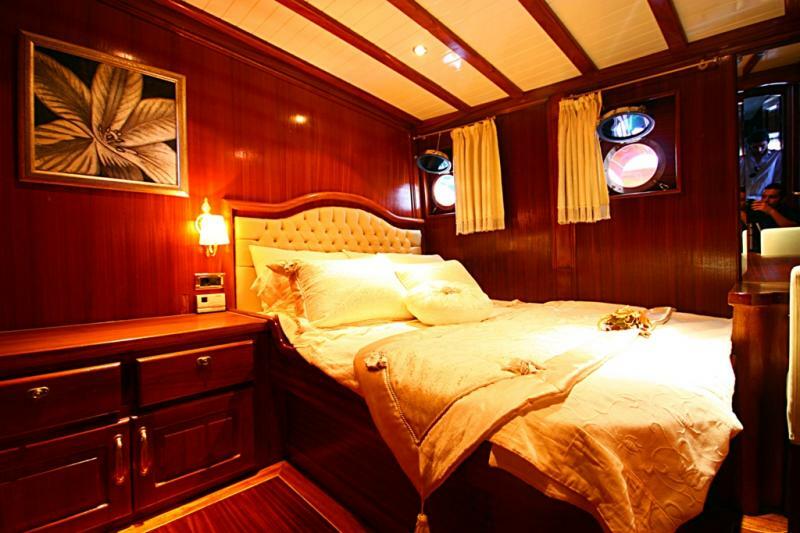 Her amenities include a flat screen television in the saloon, satellite TV, state of the art stereo equipment, VCD player, telephone and fax, washing machine and all the latest navigational equipment.